This interesting name is of locational origin from Lubeck, a port in North West Germany. Lubeck was a major commercial centre of the Hanseatic League in the Middle Ages and was so named from the Wendish "liubice" meaning "lovely". ("Wendish" refers to the West Slavonic language of the Wends - a Slavonic people who inhabited the area between the rivers Saale and Oder in the early Middle Ages). The surname first appears on record in England in the latter part of the 13th Century, (see below). Such locational names were originally given as a means of identification to those who left their place of origin to settle elsewhere. Other early recordings include Bernard de Lubic, and Hildebrand de Lubek, (Yorkshire, 1273); Robert de Lubyck, (Lincolnshire, 1276) and Hellbrand de Lubeck, (Norfolk, 1286). Richard Lubbock, sheriff of Norwich, was recorded in the Fine Court Rolls of that county in 1714, and William Lubbock was rector of Lammas, Norfolk, in 1738. 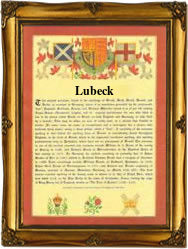 The first recorded spelling of the family name is shown to be that of Robert de Lubyck, which was dated 1273, in the "Hundred Rolls of Lincolnshire", during the reign of King Edward 1, known as "The Hammer of the Scots", 1272 - 1307. Surnames became necessary when governments introduced personal taxation. In England this was known as Poll Tax. Throughout the centuries, surnames in every country have continued to "develop" often leading to astonishing variants of the original spelling.